Hi friends. It was my birthday on Wednesday 12/5 and I had a nice time. Steve, Alex, Evy, and I went to dinner and I opened my presents there. We had fun. I got some fun things such as Coco perfume by Chanel, Lovejoy (BBC mystery show from the 80's, 90's), and "Merry & Bright" by Country Living. 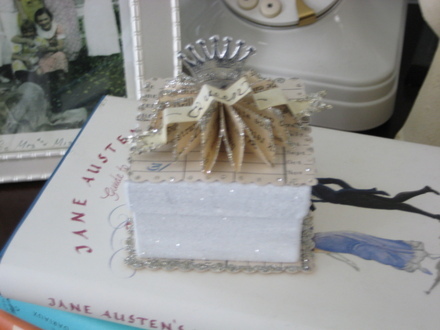 I also got a Shabby Chic book too. 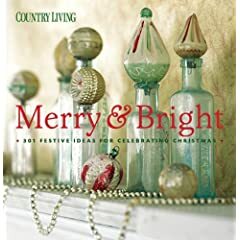 I've really enjoyed the Merry & Bright book - perfect for this time of year. 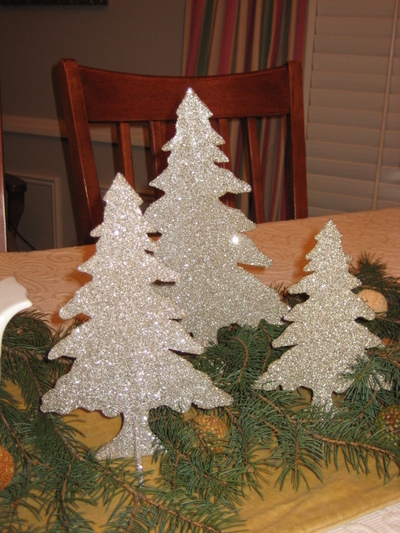 My mom sent me some fun stuff too, among which was the below glittered trees. Some folks were asking about the coffee cup from the last post. It's from Bailey's. I have a boy cup and a girl cup. The girl cup is even wearing a pearl necklace. I'll have them both in my next post. They're so fun. These trees are so fun, and very sparkly. 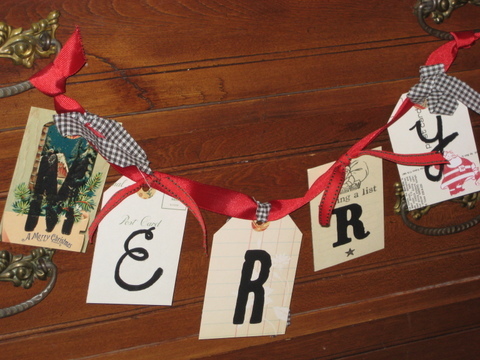 Here's a little banner I got whilst antiquing on Friday. Can you see the little silver cup? 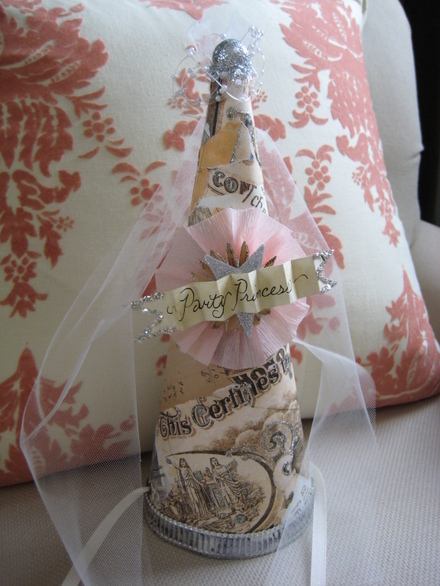 It's engraved and says, "Compliments of Mr. & Mrs. John Monson". It's so cute. Hope you're all having a great week so far. I'm back AGAIN from California and certainly happy to not be planning another trip anywhere for awhile. This time it was a business trip to San Jose. It was a very nice trip, great hotel, a whole lot of amazing food and wine - really, as business trips go, it was very, very nice - no complaints here. There's nothing quite like being at home though, especially at this time of year. I love fall so much that I don't want to miss any of the beauty that Minnesota has to offer. Green grass, leaves of burnt orange and burgundy, clusters of maple trees at varying stages and peaks of color, apple orchards, pumpkin patches, hay rides, cool nights sitting in the back yard with a fire burning. It's a really great time of year here. 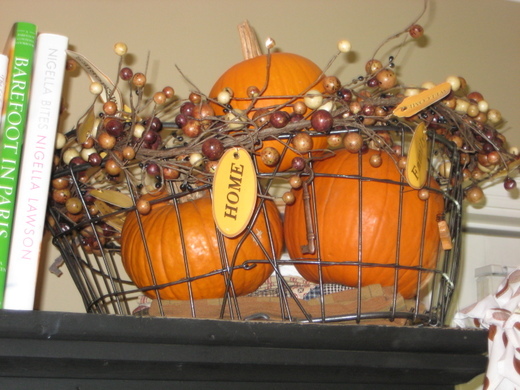 I've taken some photos of the new items I got in California and mixed them in with a few fall displays around the house. Thanks for being patient with me being gone lately. I really appreciate it my friends. 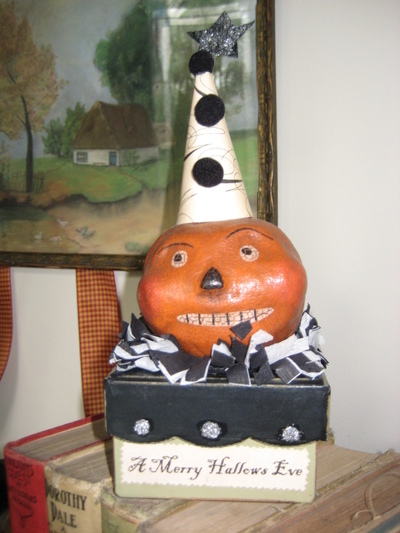 Isn't he cute...he kind of falls into the same category as "pumpkin guy" from a couple of posts ago. There's just something about that silly pumpkin grin that makes me grin in return. 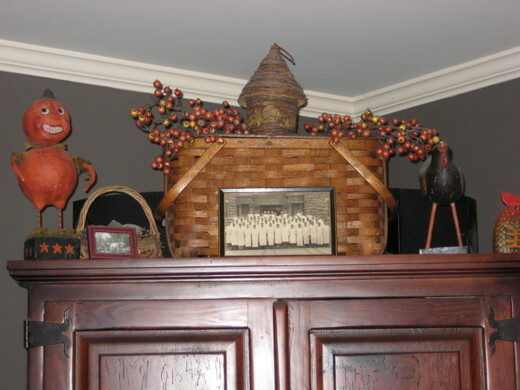 This basket is located on top of the below cabinet. 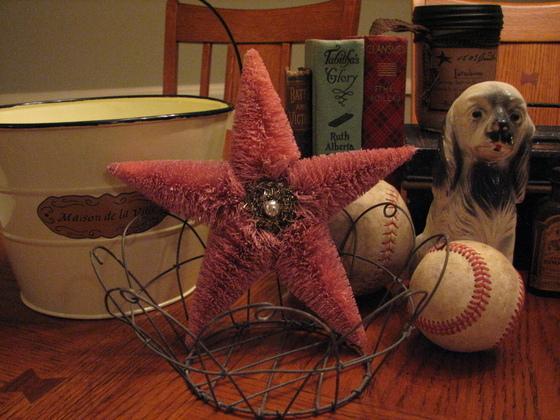 My mom gave me the decorative garland, which I wrapped around the basket. This cabinet is at least 100 years old, and was on my grandparent's farm. It's simplicity really appeals to me. 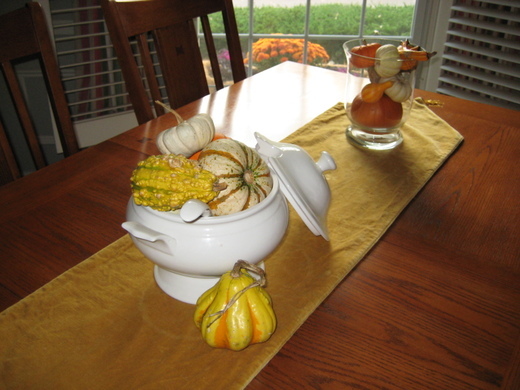 It can be so easily embellished, and especially looks great with autumn accents. The apron hanging on the right is from the Farm Chicks, which my mom got for me at their antiques show last September. 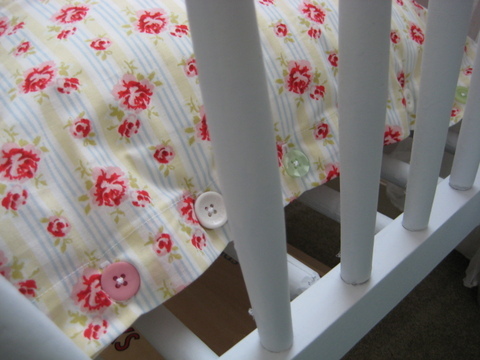 I love those polka dots. I haven't gotten these hung yet, but they'll probably be in our bedroom. 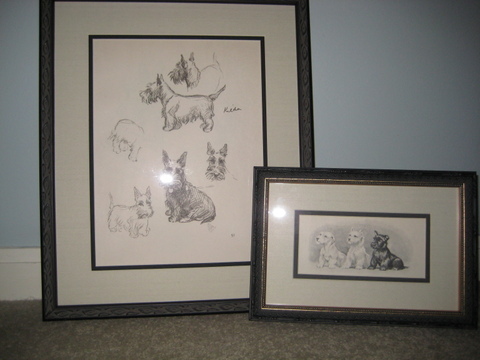 They are sketches from the 1930's. 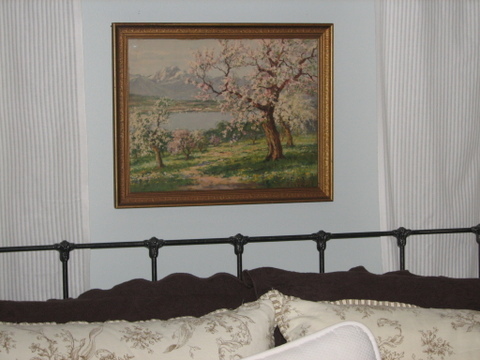 I have another in our room that is very similar, which I got last year. 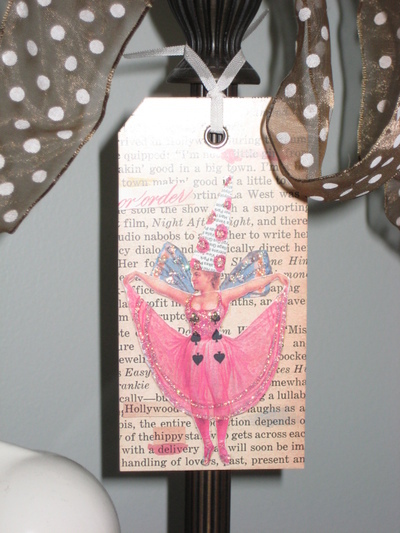 A cute little tag that I'd like to try and mimic when I get a chance. I have it hanging from the lamp next to my side of the bed. 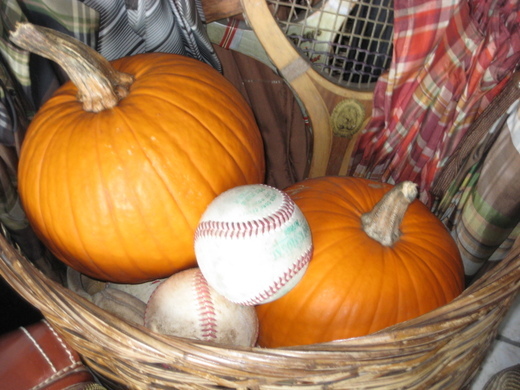 I'll be sharing more fall decorating pictures very soon, as well as a couple of other things I got in California. I can't believe we're already heading into the second week of October. 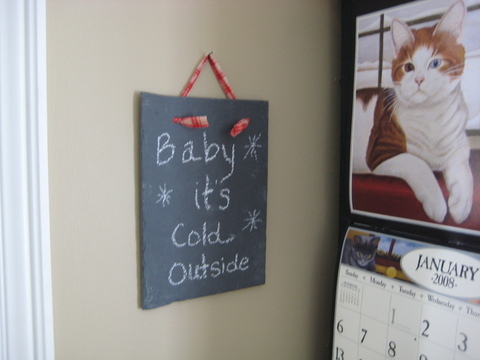 It's still in the 70's and 80's here, which is amazing, but I'm sure it will be cooling off soon. Hope you're all very well. I have taken pictures of most of the antiques that I got while attending the amazing, and very rewarding Junk Bonanza a couple of weeks ago. I believe I've established a new speed record for myself, and perhaps even the world for finding just the right place for said new goodies. 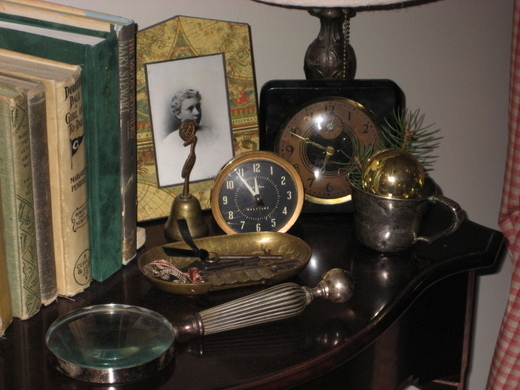 I believe it was providence, dare I say, divine providence that the new antiques slipped so easily into our home. I digress. 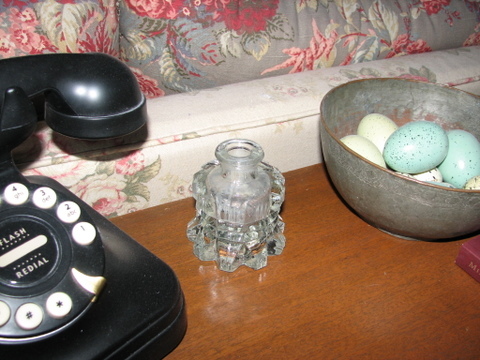 Here are pictures of most of the items, although the hand and ring displayed inside the cloche are not pictured, but are very happily sitting on my bedside table looking quite like they've always been there (do I hear utterances about divine providence again? ehem, okay, okay moving along). I plan to try and capture some of the other items I got, a couple are Halloweeny so I'll save those for a bit later. 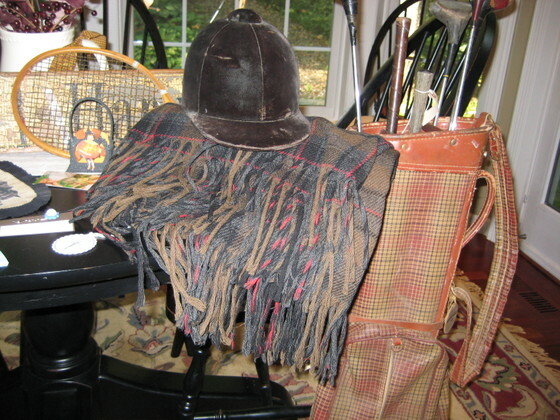 Pictured new items are the golf club set with plaid bag, the bag sitting on the floor nearest the chest, and the riding helmet sitting on top of it. 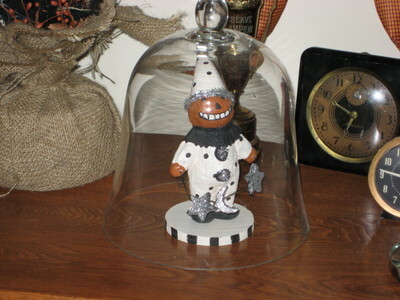 Okay, so this guy isn't part of my recent antiquing expedition, but he's cute, and really that's about all the explanation necessary I think. I got him at Michael's - he may look familiar to you. Pictured here is the snapshot of lab coat people outside the Natural History Museum. Love the lab coat people. I know that not everyone would agree that Mr. Pumpkin Guy is cute, but I think he's hands down adorable. I just paused to look up at him as I type this. Yup, he's still totally cute, and in case you're wondering, he is indeed still smiling. 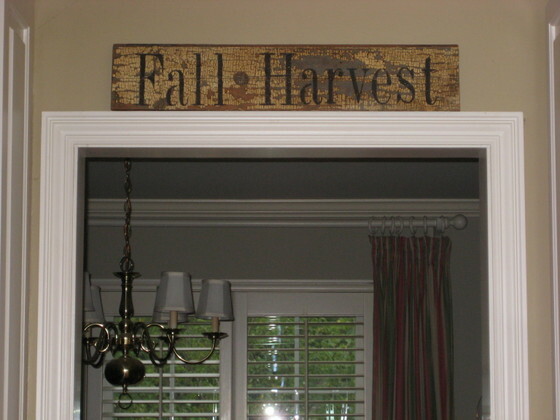 I really, really like the Fall Harvest sign that I got. It's in the kitchen - the room you can see behind it is the dining room. 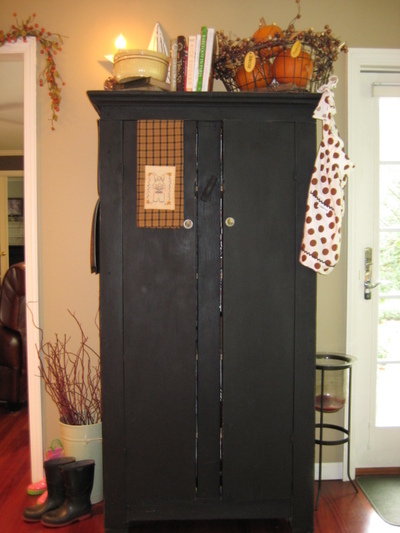 The DR is a very pale gray color - the Kitchen is that caramel, butterscotchy color. Here is the tartan plaid Pendleton blanket that I got (I already posted a similar picture earlier). 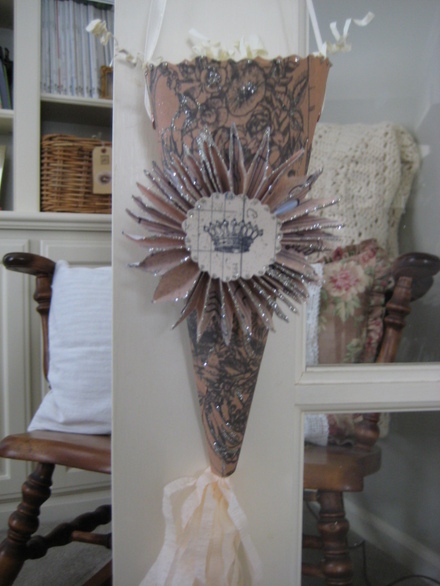 A close up of that great Junk Fairy wand that I got at Kari's wonderful booth at Junk Market. 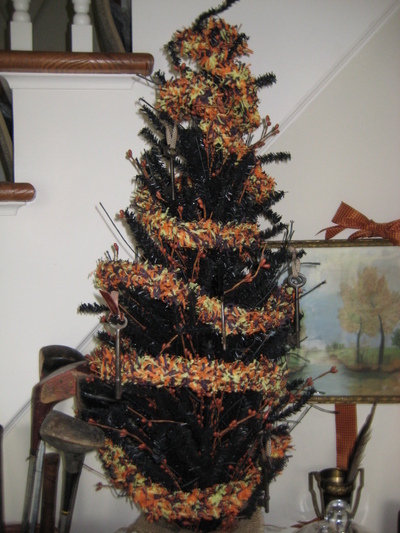 It's tucked into the Halloween tree. Well, I don't have a picture of everything I got, but it's a few things just so you can see how they're fitting in. They're mingling well with the other antiques and decorative elements. They haven't started any fights or even engaged in any name calling. So, success all around I'd say. Also, I wanted to let you know that I'll be out of pocket a bit over the next week. I hope everyone's doing well. Thank you for being such wonderful blogging friends. It really does mean so much to me. Talk to you soon. 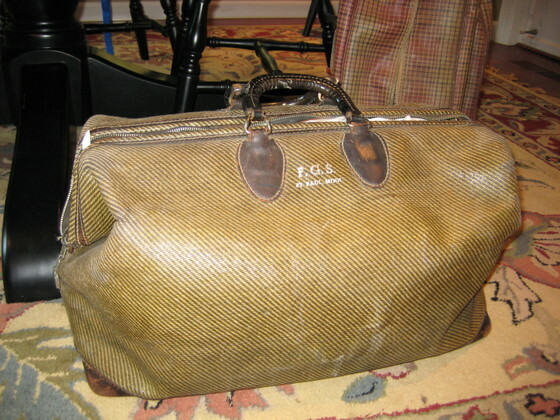 What could be better on a Friday than taking the day off of work to experience a full day of brilliant antiquing? 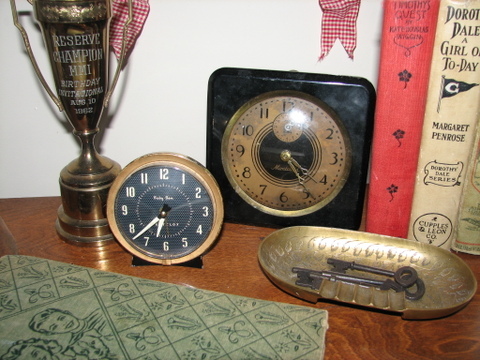 That was actually a rhetorical question - no answer required because there isn't much that could be better - maybe some things are evenly matched - I'll give you that, but I can't off the top of my head think of much that is better than a day off to find amazing antiques. 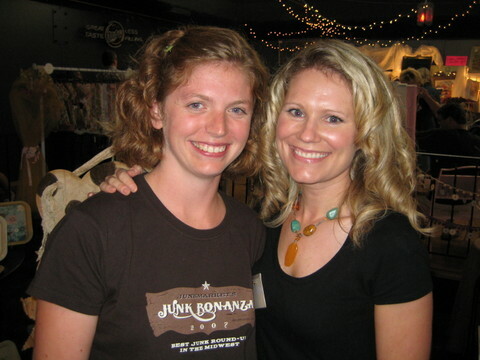 My sister-in-law (Erin), and I got an early start on Friday morning to go to Junk Bonanza - an annual event that is put on by the Junk Market girls Sue and Ki - contributing editors to "Country Home" magazine. We got there just before it started so that we could experience it all from the beginning. It was WONDERFUL!!! Every booth was good - no crap, just great stuff!! 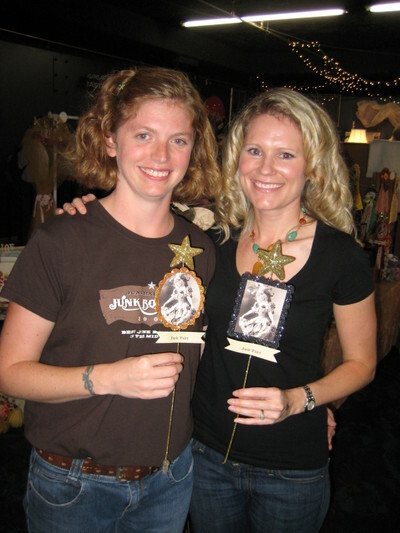 Over 100 vendors were there, including the beautiful, talented, and very sweet Kari from Artsy Mama. I was so excited to meet her and see her pretty creations. Here we are at her booth. 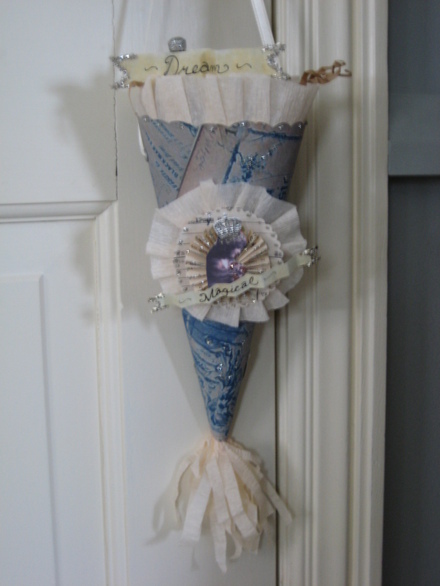 The Junk Fairy wands were made by Kari - they are so cute! Kari had so many wonderful things in her booth and she displayed them so well. Also, her dad took the pictures and was helping Kari in her booth. He is so sweet - what a cutie! Also, thank you Erin for being my antiquing buddy all day - we did have a fantastic time. It was so fun to meet Kari in person - I'm so glad she lives near me. 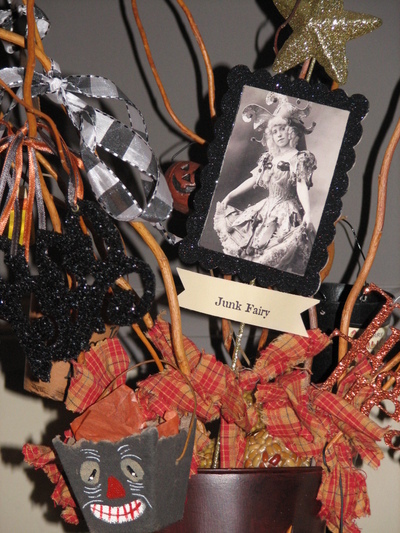 Look at those great Junk Fairy wands - so cute! Look at that golf bag. I got the bag and four old drivers for $18. I really love that plaid. Also, I was very excited about the tartan blanket, and the riding helmet that was made in Greenwich, CT.
Kari made the wand and the Halloween witch that is laying over the top of vintage ledger paper. I love them! 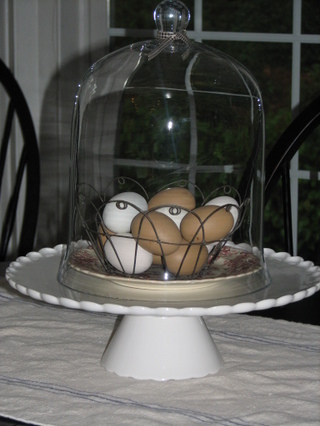 I got the tall glass cloche to add to my growing collection. 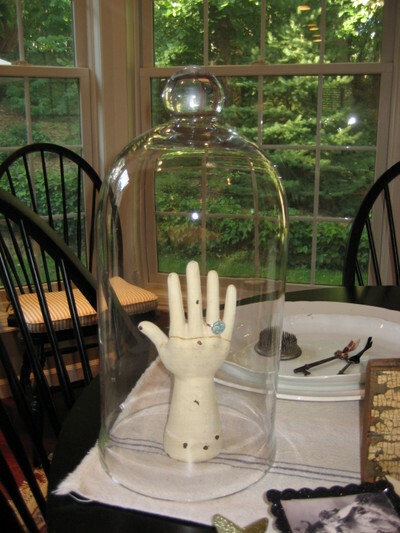 The hand under the cloche is cast iron - It's so heavy. The ring is from The Junk in My Trunk - the creation of a fantastic woman named Karen Ross Smith, who was also at Junk Bonanza. The ring is a beautiful vintage button. I also got a bobby pin with a very cute vintage button. They are really great - Karen does a great job with the jewelry - they are really well made. And seriously, that hand is fantastic for displaying such a great ring! 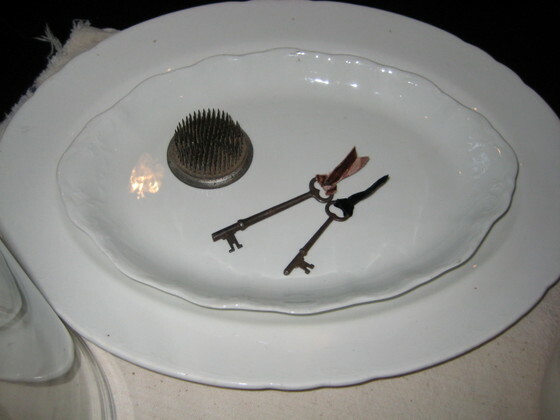 Skeleton keys from Kari's booth, a frog, and ironstone platters to add to yet another collection. I nearly had a spasmic attack when I found this bag - $14. Yes, $14. 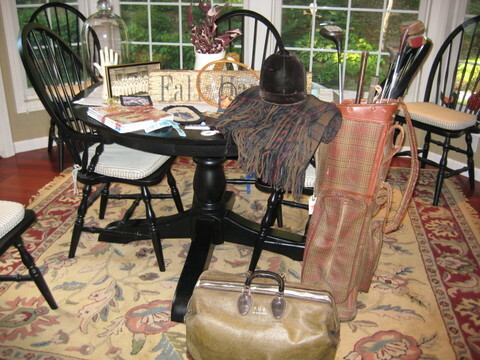 The bag, riding helmet, and golf bag are all in my entry now - I'll take some pictures later to show the new display. 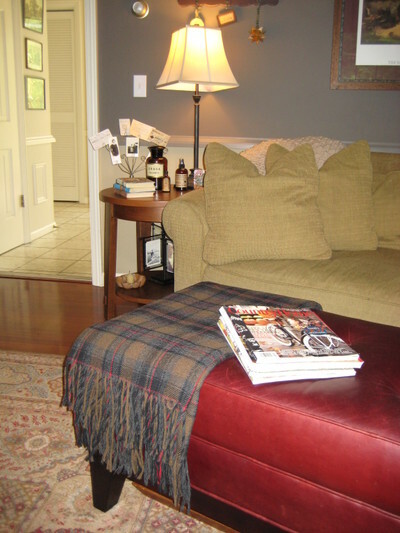 Just wanted to show my new tartan blanket on the bench in our family room. I sure do get excited about those colors - especially at this time of year. Tonight we have a block party in our neighborhood. Not sure what I'm making yet. Last year I won the prize for best salad, which was an asian salad and so good. Not sure I'll be winning any prizes this year. Hope you have a wonderful weekend! First and foremost I wanted to thank you for all of the comments that I received about my last post. It really, really touched me and I'm so grateful for your kindness, support, thoughtfulness, and friendship. Aren't we so lucky to have this amazing network of friends - it's a gift we keep giving to each other. Thank you so much - I'm giving each of you a huge hug and blowing you a kiss. Last weekend Steve, Evy, and I went to the Haupt Antiek Market in Rosemount, MN. 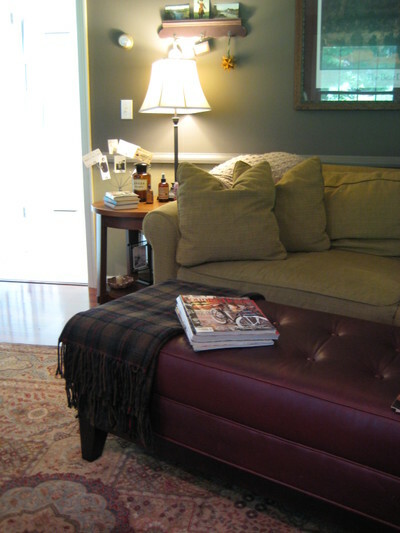 If any of you have the October 2006 issue of Country Living you will be able to see them featured. It's a very fun place to go. An old house, yard, and out building filled with wonderful antiques. 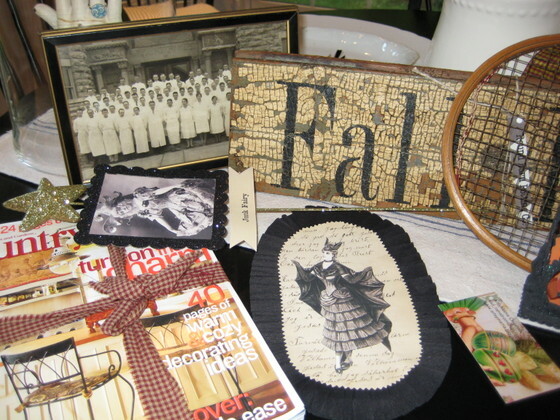 It's open once a month for four days, and each month there is a new theme and all new antiques. 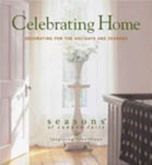 They also contributed to the book "Celebrating Home", which I LOVE. 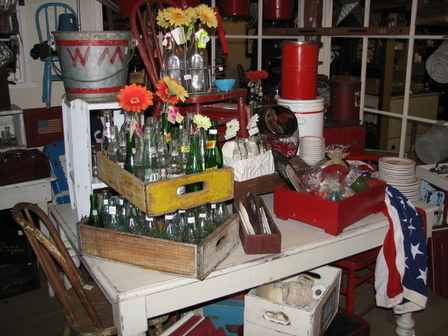 I only got four things as I am saving myself for September 7th when I will go to Junk Bonanza and to Buffalo, MN for the some major antiquing (will be primarily at Buffalo Nickel Antiques and Second Hand Rose). 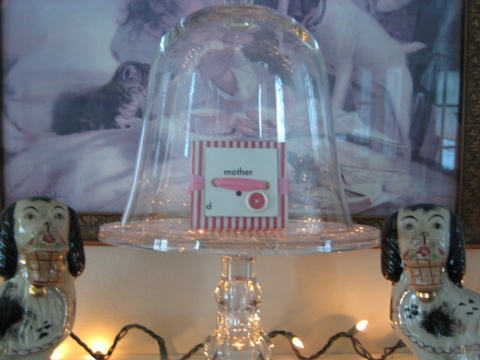 I got the little clock, called a "Baby Ben". So cute. Below is a picture that I found at Haupt. I love the colors and it matches the blue of our paint so perfectly. I got the little ink well next to the phone. I wish it had the top to it, but maybe I can find an old pen that would look good sticking out of it. I think my dad had one, I'll have to ask my mom. 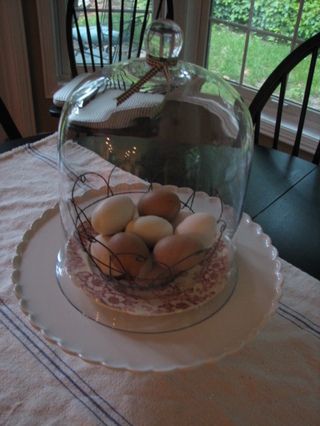 I found this large cloche - I do love a good cloche ya know. I have three now, small, medium, and large. 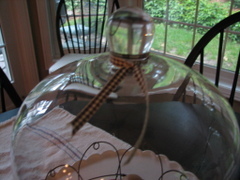 It works great on the cake stand. And finally, I wanted to share with you a wonderful candle find - 1803 Candles. They smell sooo amazing, are handmade, and are soy. They are wonderful!!! Here are the two that I have and I love them!! You can order them online - I HIGHLY recommend them. The packaging is so cute and uses regular canning jars. 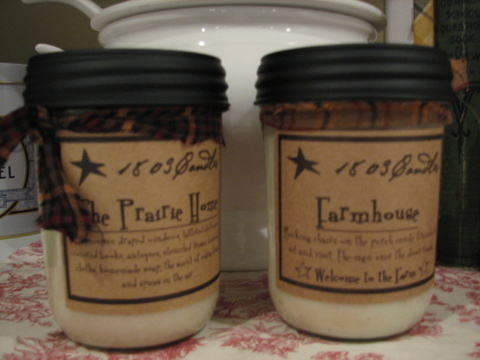 Farmhouse is my favorite of the two, but I really like both of them very much. 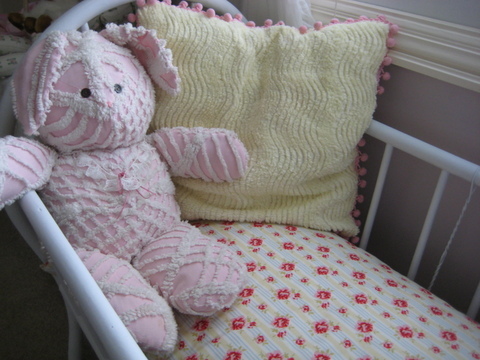 Evy and I are off to get her a hair trim at Kid's Hair, then to Michael's for some Martha Stewart supplies, and then to the mall to do a bit of shopping for Evy and I. Sounds like a super day I think. Then, for tonight, Steve and I will be watching "Midsomer Murders - Garden of Death" we just got in the mail from Netflix. Last night it was just party, party, party as we watched "Highschool Musical 2". Pizza, popcorn, chocolate - a very fun night! Thank you again for being my supporters, visitors, and friends. We are all so fortunate to have this forum to share our thoughts, hobbies, and general goings on in our lives. Thank you and have a wonderful weekend!! 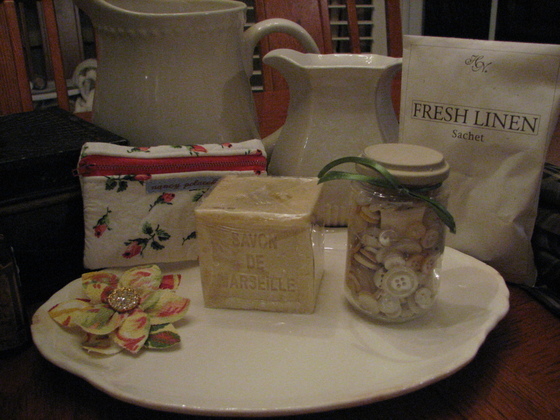 These are some of the items that I purchased the day my mom and I went antiquing. I think I inadvertently adjusted something on my camera, which resulted in grainy pictures - sorry about that. Isn't that chalk dog great! I was so excited when I saw him. 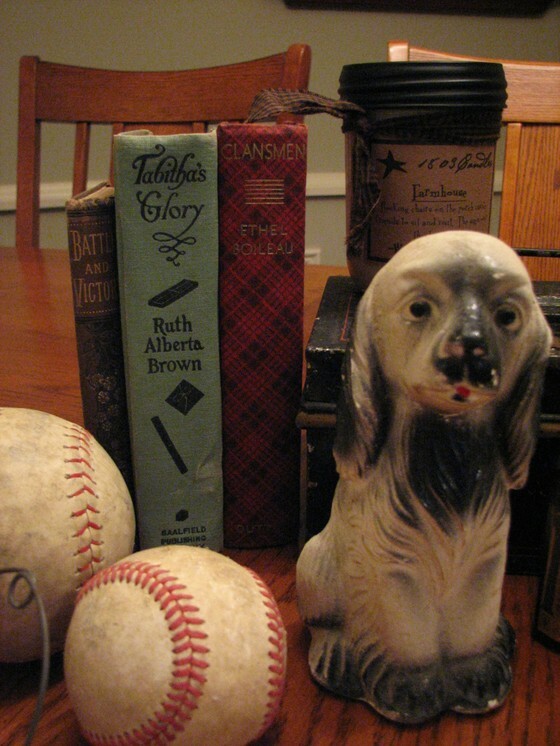 And the tartan plaid book - it looks great with a set of scottie dog bookends that I had (not the ones you all saw in this post, but a different set - I tried to take a picture of them, but the plaid sort of freaked out the camera and it didn't know where to focus - resulting in bluriness). 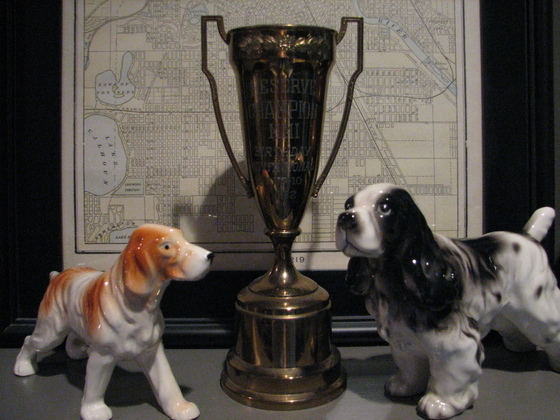 I'll see if I can get a different shot of the bookends so you can see. 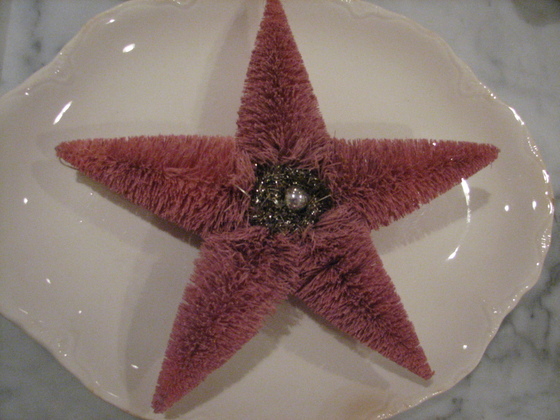 I loved this pink star with the tinsel in the middle. 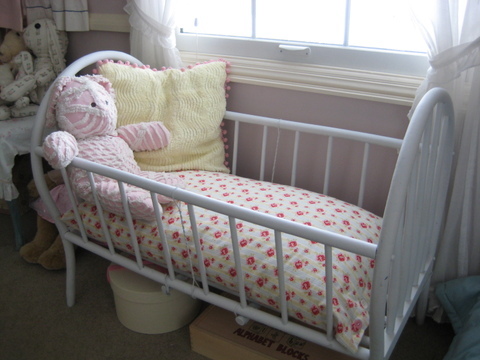 It's in Evy's room now. Sorry for the grainy picture below. 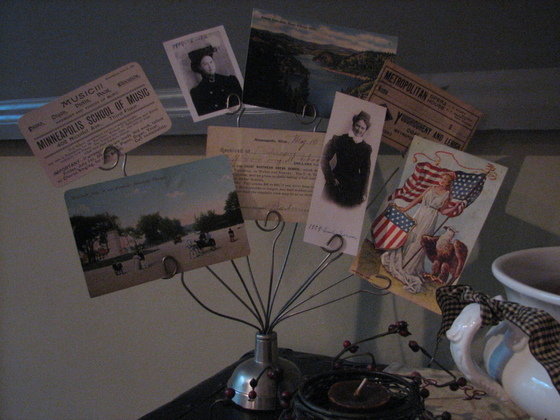 I found that holder and then added pictures of my great grandma Emelie, postcards from relatives in the early 1900's (the one with Lady Liberty and flags is to my great grandma Emelie in 1907 and is written in Norewegian). I also have some very old tickets to a play that were my relatives from the early 1900's (they are in the envelope on the right). There are a couple of receipts there too. 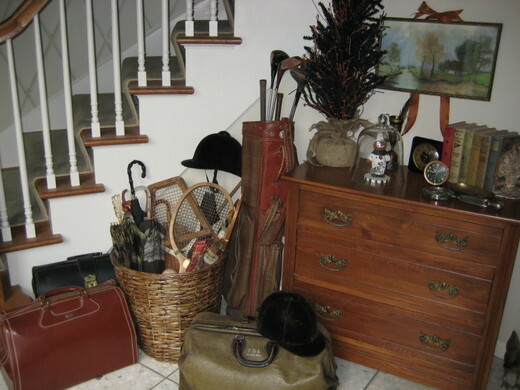 All of these things were at my grandparents farm - oh the treasures they had there! The below are a couple of other dogs I found . 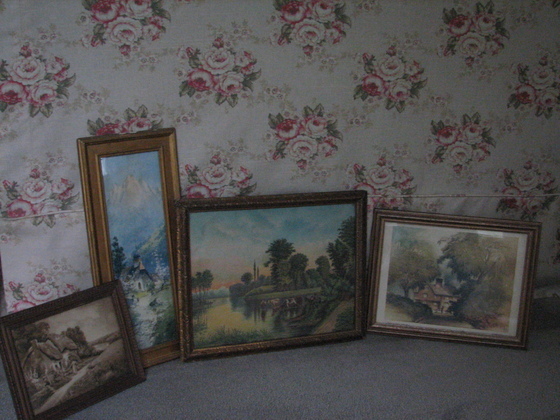 Here are some prints that I found - they are propped up against my couch. Again, what is the deal with my camera! 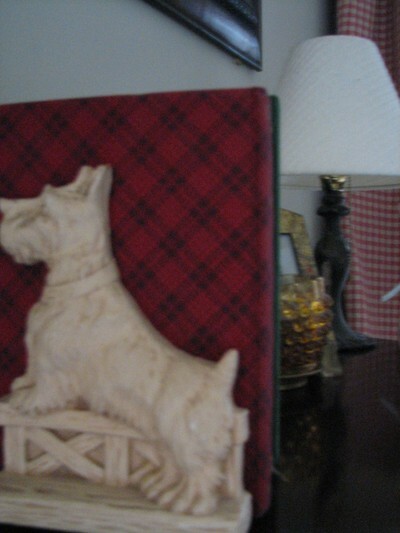 I'm includint the picture of the scottie dog book ends and the tartan plaid book - it is very blurry - sorry. But they are so cute! This is in my living room. 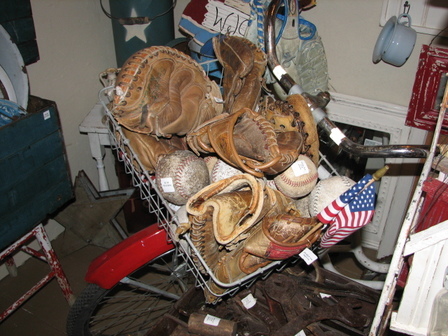 And these are just a couple of pictures from the Buffalo Nickel where we were antiquing. I love this diplay and all of the great colors. Bikes with baskets - just love them. Sorry for all of the pictures, but wanted to try and make up a bit for being so absent lately. My mom and I are having a great time, and are going to have tea today at Lady Elegant's Tea Shop (with Evy too). I'll bring my camera to share the experience.